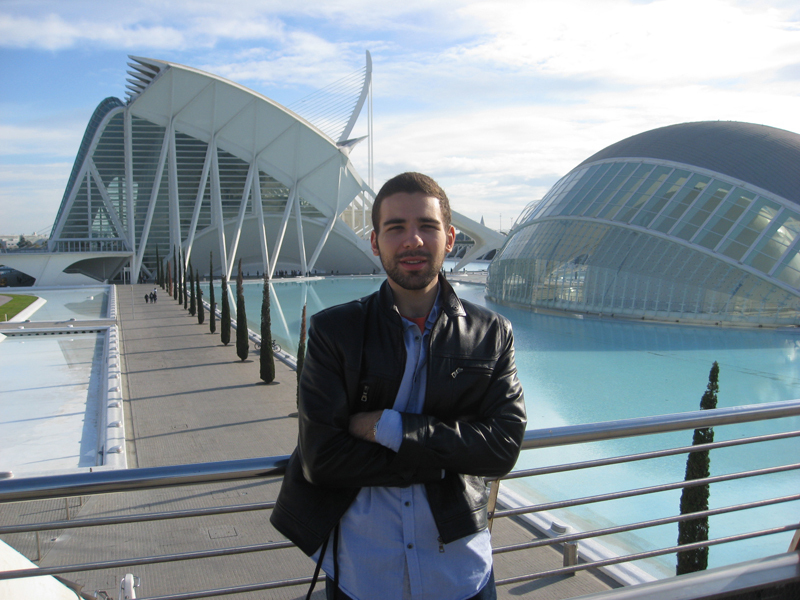 I spent the 2011 fall semester in Valencia, Spain as part of a study abroad program at the AIP Language Institute. Finding the Valencia program was fate. I still feel like it's a rare, undiscovered secret that only I was privileged enough to explore and call home. It fulfilled a combination of desires for me. I knew I wanted to learn Spanish, and had boiled it down to Spain because unlike South or Central America, I'd have access to traveling throughout Europe and North Africa. From there, I realized I wanted a city of a decent size. Madrid and Barcelona were the other two Spanish cities for which programs were offered. I’d been to Madrid and enjoyed it very much, but I didn't like that it was so far inland. I heard Barcelona was amazing, but its main language was Catalan. Then I came across Valencia, Spain's third largest city, located east on the Mediterranean coast. With about 800,000 people, it was an ideal size for being able to experience that large metropolitan vibe while still being able to run into familiar neighborhood faces. Valencia is also the birthplace of paella, and boasted some of Spain's best cuisine (in my humble opinion). A mixture between the fresh caught seafood from the adjacent sea and the best rice dishes, as well as the sweet delectables like buñuelos and the sugary almond treat turron. But dessert for me tended to be fruit, as I took advantage of the region's incredible bounty (the Valencia orange being one of the most delicious fruits I've ever had – that perfect balance between sweetness and citrus acidity). For me, eating my way through a place's cuisine is the ideal way to understand its history and culture. My application process was typical: filling out a mound of paperwork. For me, there was a bit more work (and aggravation) involved because the program was administered through a different US university, so I had to do even more transfer paperwork. There was a lot of going around in bureaucratic circles. But all that hassle is nothing in comparison to the exhilarating experiences and once-in-a-lifetime memories I was rewarded with. My only advice for completing the paperwork is to start early and keep an organized file of the applications, keeping checklists and staying aware of the deadlines. I remember returning to New York on a bitter cold mid-December night, a stark contrast to the mild warmth I had been enjoying in Spain. The following two weeks went by somewhat smoothly, with minimal sentimentality and sadness because I was occupied with holidays and the joy of seeing my family again. It wasn't until I returned to school in January that the pain really started to kick in. I missed Spain badly, to put it mildly. My teachers, my friends, the city's character, rhythm, buildings, food, and especially my host mom. Nearly one year after going to Valencia, I find myself still thinking about it constantly, several times every day. Before I go to sleep, in the shower, when I wake up, taking the train home from school; it's safe to say that I am legitimately obsessed. To quell the pain, I read Spanish newspapers online and wax nostalgic about my time there – looking at photos, reading my moleskine journal from abroad, and even looking at the Facebook pages of friends from Valencia. I feel like I'm a part of Spain now, and that Valencia is my second home. So when I read about the current economic crisis that's plaguing Spain, holding the Eurozone's highest unemployment rate around 25%, it pains me. Do you plan on going abroad again? I've realized, in large part due to living abroad, that I'm someone who acts on instinct and gut feelings. When I get "that feeling," I know to trust it because it's hardly wrong; one of my few, few sources of pride. Now, my guts have told me that I need to return to Valencia! I'm excited to say I've already booked a return flight for this coming March to experience 'Las Fallas,' undoubtedly Valencia's biggest holiday. It's a weeklong festival that includes a cacophony of fireworks, music, and the final burning of towering effigies. Las Fallas is unlike any other holiday or festival I've heard of, and it's absolutely crazy – the pinnacle of Mediterranean hedonism run wild. I can hardly wait for it. For me, what it really boils down to is that the quality of life in Valencia, and thus my happiness and feeling of accomplishment - mainly taken from the great pleasure of learning a language and building your vocabulary and conversation ability day by day - were way ahead of anything I feel here in Brooklyn, New York. Don't get me wrong. I love my city and my family and wouldn't trade them for the world, but right now, I feel like to grow as a person and give myself the fulfillment I need, I have to return to my second home, Valencia. My inhibitions are mainly that if I return for a while, my experience won't match what I felt when I studied abroad there. The possibility of not recreating the same magic looms over me. But I realize that no matter how bad it could possibly be, it cannot ever taint the golden memories I had and will always have of it. The most important piece of advice I could give to anyone looking to live abroad would be to have as open a mind as possible about everything: what you eat, the cultural customs, the modes of transportation, etc. Even if you find yourself not liking some aspect of the foreign culture, and trust me that might happen, try to at least accept it and be respectful of it. Remember why you're studying abroad in the first place: to expose yourself to a new way of living and immerse yourself in a new culture and rhythm. You have to be like a sponge and absorb as much of it as you can. Facebook, watching TV, McDonalds, and all things-American can wait until you return home, where you'll have all the time to indulge in them. Take advantage of the stuff you can't do back in your home country. Traveling is a rush, an exhilarating moment incomparable to most other things in life. For me, that first month abroad was like riding a euphoric wave of feeling liberated and suspended in the moment. I remember my first month abroad included Madrid, Valencia, and then a club- and beach-crazed weekend spent on the wild party island of Ibiza where the nightlife and clubs are notorious. 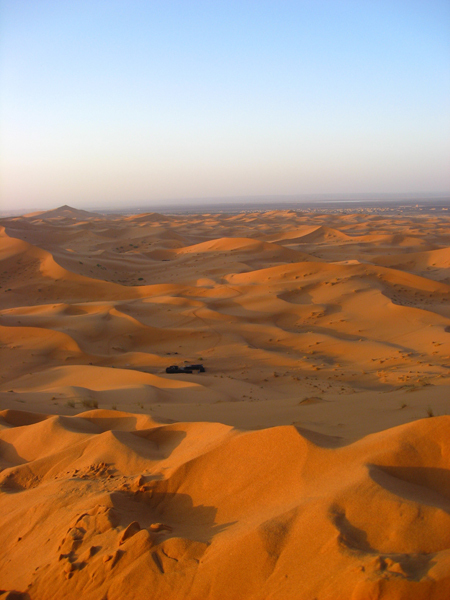 One week later, I went from the club scene in Ibiza to riding camels through the dunes of the Sahara Desert in Morocco. I remember experiencing sensory overload, in the best way. I remember a torrent of different sounds, smells, and sights in the labyrinthine alleys of the medina in Marrakech, haggling along the way for ceramics, leather, spices, and decorative objects. It was such a rush that I felt viscerally suspended in the moment. It wasn't until returning to Spain that the Morocco trip sunk in and I could actually process all I had done and seen. That's important, I think, especially living in the social media-crazed age where people feel the constant need to broadcast and share what they've just done. Traveling has affirmed my belief that it's paramount to disconnect from technology sometimes and allow the natural impact to seep in. So, I suppose that would be my final piece of advice: try to disconnect yourself from the Internet and technology and enjoy the moment to the max. In the long run, you won't regret it. What are your future plans for your career and going abroad? As of now, I am set to graduate in June from CUNY Hunter College with a bachelor's degree in Media Studies. I've already made plans, while not yet fully developed, to take some time off after undergrad and return to Spain. I am going to try and find a job or internship somewhere in the vast field of media. My mind's run agog with possibilities: finding a job or internship, teaching English, or even enrolling in a Spanish university for graduate school. In a perfect world, I would be a foreign correspondent based in Madrid for The New York Times. Ideally, after spending a year or so in Spain developing my language skills, I would then move to both France and Italy for extended stays (at least six months) and soak in each country's rich gastronomic, cultural and historical pleasures. 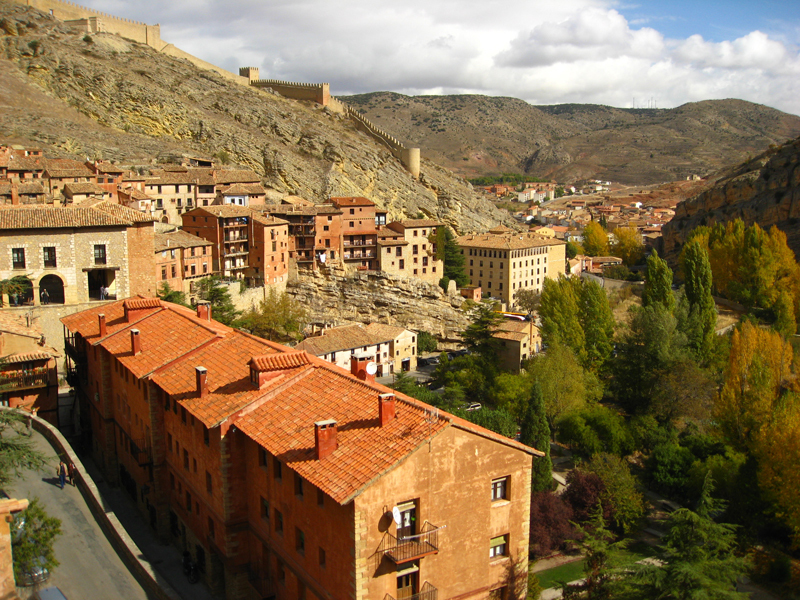 Omar writes clearly and thoughtfully about the cross-cultural experience of living in Spain. He mentions that he wants to return to his host city of Valencia to re-live the same depth of euphoria that he experienced on his first visit. As a word of caution, almost all of us fall in love with our first host country. In terms of building global career skills, he might want to consider broadening his experience by living in South America. This would provide Omar with additional marketable skills and extend the value of his overall international experience. By going to South America, he would deepen his expertise of the Spanish language, which could help build towards a future career in international business, communications, public relations or journalism. I also recommend that Omar further develops his ability to speak about cultural traits and norms in professional terms. This is a valuable skill for anyone building towards an international career. Imagine this scenario: Omar finds work teaching business English in Chile. Once established, he makes use of his free time by finding an internship in his field or going to school part-time at a Spanish university (while continuing to teach English on the side). Omar would then quickly become conversant in cross-cultural communications and the cultural norms of Spanish-speaking people. All of this would stand him in very good stead as he began trying to make a name for himself as a foreign correspondent. Start by checking out the many articles and resources in The Effective Overseas Employee and Living Overseas. Search through our extensive Cross-Cultural Skills resource list. You'll even find a few resources dedicated specifically to Spanish culture. To benchmark your analysis of other cultures, you should be familiar with your own culture, read our section on The North American Identity.